RoboCon 2019, an annual gathering of the Robot Framework community, took place over three days last week. Eficode is a founding member of the Robot Framework Foundation and was proud to host the Sprints at our headquarters this year. Access two expert talks from the conference in this blog. Eficode sponsored RoboCon 2019 and held sprints at Eficode's headquarters after the main conference day. It all kicked off with several hands-on workshops on Wednesday 16 Jan. RoboCon’s main conference day was held the day after at Bio Rex followed by the sprints on the last day on Fri 18 Jan, at Eficode’s headquarters in Helsinki. 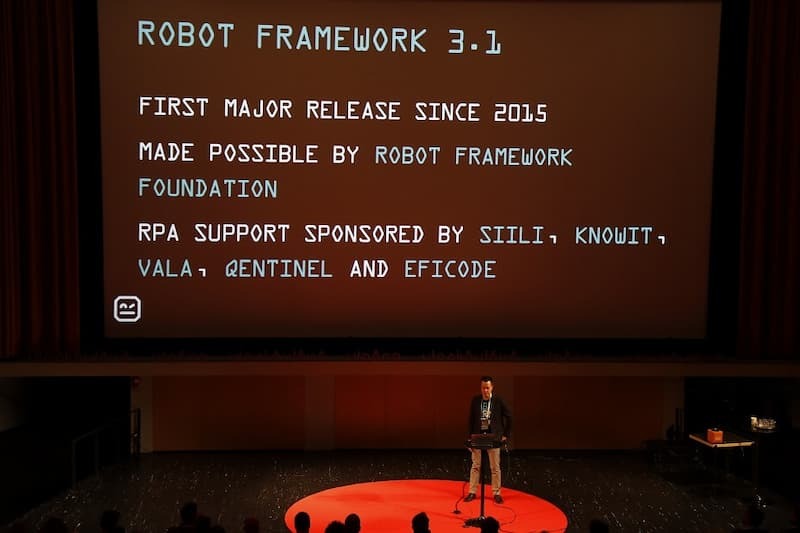 RoboCon 2019 included many cutting-edge talks. Juho Saarinen & Joonas Lehtimäki, two of Eficode’s Senior Consultants, also took the stage during the conference. Below are their presentations for you to view and enjoy! After the conference & after party, around 35 participants gathered at Eficode to contribute to existing projects in Robot Framework ecosystem by developing & coding. The day was a success, with the outcome of two new projects, several merged pull requests in different projects, and a sauna session to relax and network in a Scandinavian manner with other Robot Framework users and developers. Eficodeans also contributed to projects they maintain: Juho (mentioned earlier) worked on a new version of Java port of SeleniumLibrary whichs release was prepared on friday & tried to solve OCR dependency issues, while Aleksi made great headway for the next release of Jenkins plugin.